Web page and Website are relevant but distinct words. A web page can be considered as a single entity whereas a website is a combination of web pages. Web pages are accessed through a browser while in website HTTP, and DNS protocols are used to access it. Web pages have the navigational links to connect a web page to another on the website. 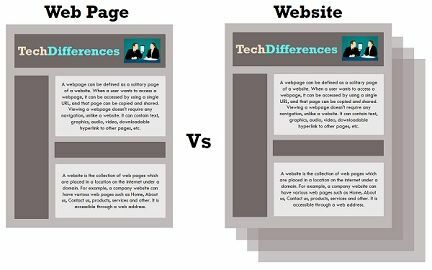 The content in a website changes according to the web page while a web page contains more specific information. Basic Web page is a part of website which comprises links to other web pages. Website is a cluster of related web pages addressed to a typical URL. Presented by Multiple web pages can have the same name if they reside in different documents. By a unique URL. Use It is a content that is to be displayed on a website. It is a place used to display the content. The web page URL has an extension. There is no extension used in the URL of a website. Web page address depends on website address. Website address doesn't rely upon web page address. Development period Requires less time to develop as it is a part of a website. Usually, take more time as compared to a web page. A web page can be defined as a solitary page of a website. When a user wants to access a webpage, it can be accessed by using a single URL, and that page can be copied and shared. Viewing a webpage doesn’t require any navigation, unlike a website. It can contain text, graphics, audio, video, downloadable hyperlink to other pages, etc. Web browsers are used to display the contents of the webpage through connecting to the server so that the remote files can be displayed. These are created by using a programming language such as HTML, PHP, Python and Perl etc. The HTML pages have a simple appearance and are not that interactive but consume less time to load and browse. There are two types of web page – Static web page and dynamic webpage. In the static web page designing, when a product acquires any change in information, the change must reflect on the website. At that time, a person must incorporate the change on every web page manually, and this is time consuming and tiresome process. Where in the dynamic web page, a central database is used to store the product information. The database-driven approach, just need the change to be applied at a single place. So that through extracting the relevant information from the particular database, several web pages can be created dynamically that contain this information. A website is the group of web pages which are placed in a location on the internet under a domain. For example, a company website can have various web pages such as home, about us, contact us, products, services and other. It is accessible through a web address. The website can be designed using static web pages or dynamic web pages. Contents on a website are globally viewed, remains same for the different individuals. A website can be industry-specific, product specific or services specific etc. ; these websites are intended to educate their site visitors about their industry, products or services information. A website must be hosted on a server at first so that it can be accessed on the internet. Websites cannot be indexed. Search engine crawlers crawl web pages and index web pages rather than a website. A website is navigated from one webpage to another. A webpage is an independent part of a website that contains the links to other web pages on the website. On the other hand, a website is a collection of relevant web pages that is addressed to a Uniform Resource Locator. Each website must have a unique URL whereas multiple web pages can have the same name until they reside in different documents. Website is a location used to display the content. In contrast, a webpage is a content that is to be displayed on the website. A web page URL has an extension like html, htm, php, etc. As against, website URL doesn’t has any extension. Web page address has an integral part of the domain name in it, and it depends upon a website. On the contrary, a website does not have any relation to web page address. Designing and Development of the webpage takes less time as compared to a website as a website contain a lot of web pages. A website represents all the contents that have placed online and involved each type of file. The web page is a part of a website which drives a website and holds it together. Amazing content. Thanks for sharing such a great topic. Please send me the difference between hyperlink and hypertext.